NECO, Threadless, Internal Cups, Straight 1-1/8"
To run the forums, host the website, and travel, I charge a universal service fee for my reviews. 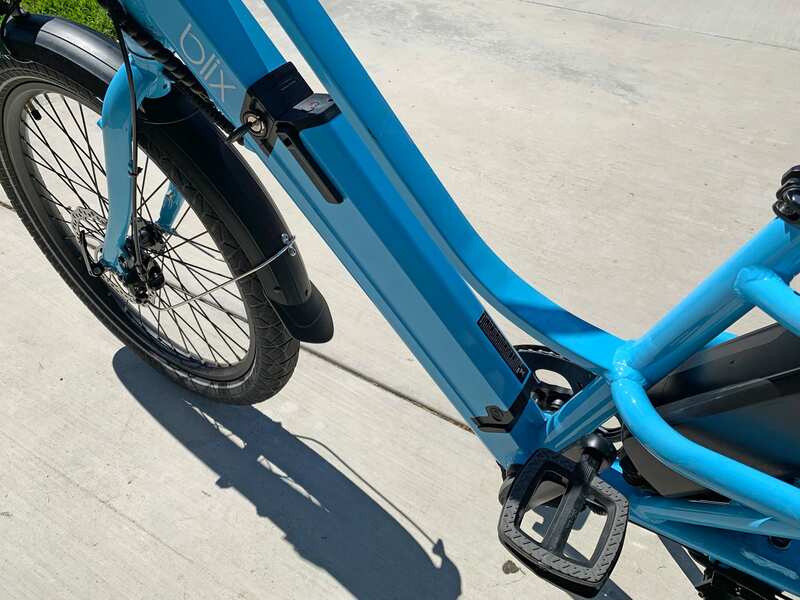 This review was sponsored by Blix Bikes. My goal is to be transparent and unbiased, this video and written review are not meant to be an endorsement of Blix products. 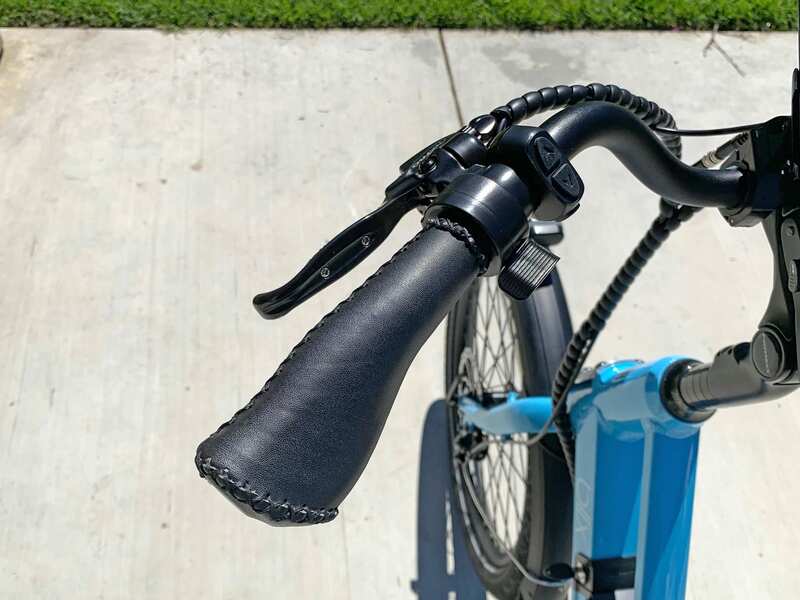 [NOTICE: The Blix Packa is scheduled to launch on Indiegogo on March 26th, they requested that I publish this review early and have posted more information on their official website in the meantime.] 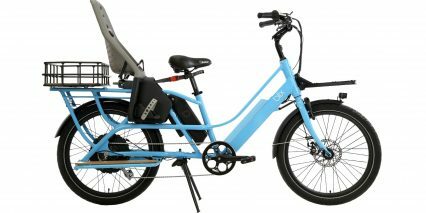 The Packa is a mid-tail cargo electric bike offering lots of utility, value, and good looks. 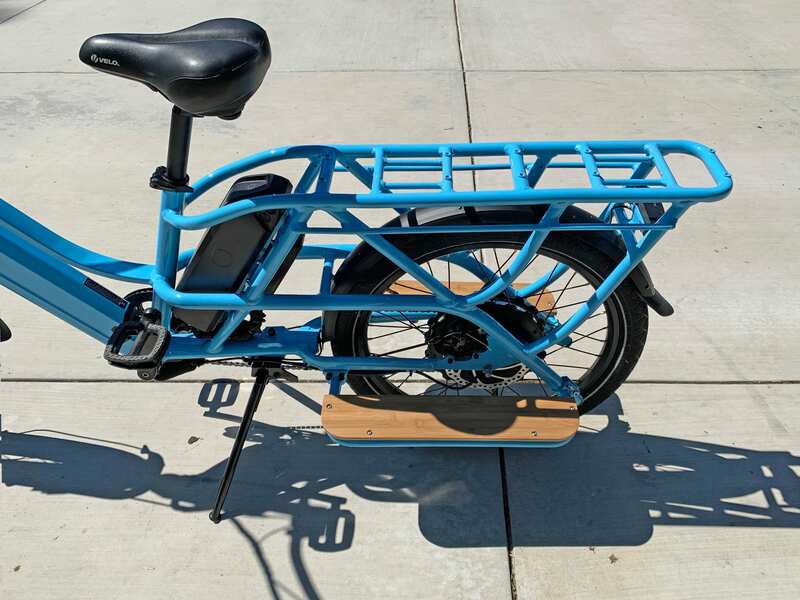 It’s unique in many ways, but fits in line with a growing number of approachable cargo models that allow you to move more stuff or even transport a child or friend. 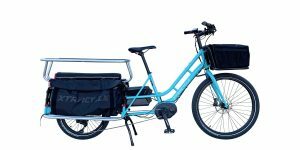 The Packa has an extended rear rack that is reinforced with beautifully positioned Aluminum alloy bars to handle up to 150lbs. There are two Yepp! 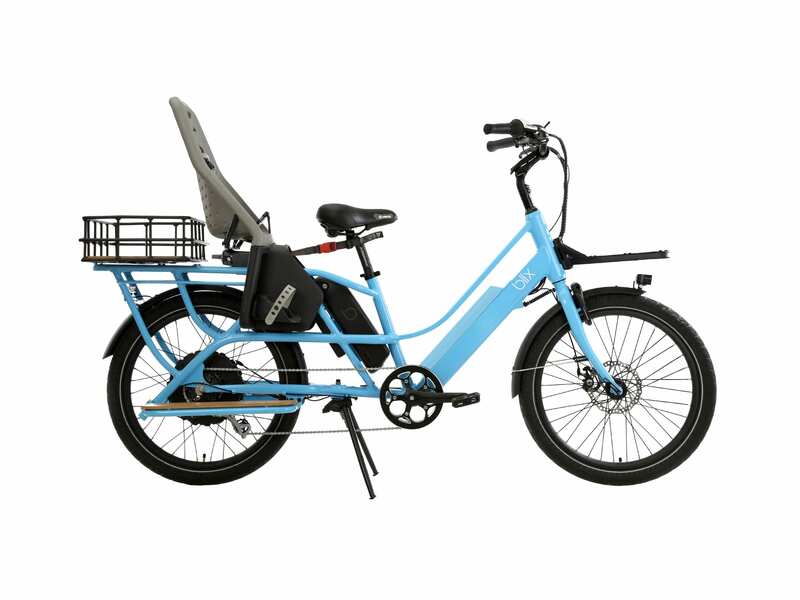 windows on top of the rear rack, so you can fit the Maxi Easyfit (as shown in the video). The company also sells seat pads for adult passengers or a surround-bar for kids. 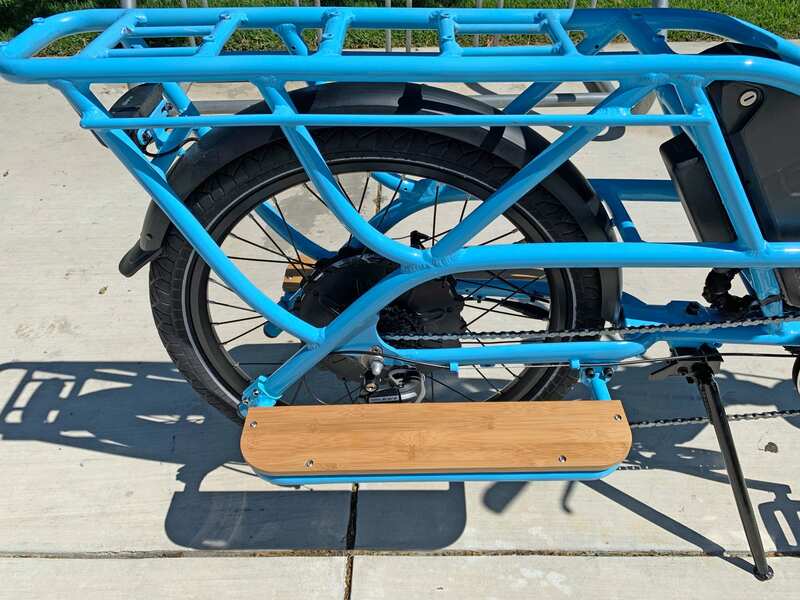 An optional front rack or basket can handle 50lbs more, and the total load capacity for the bike is 400lbs. 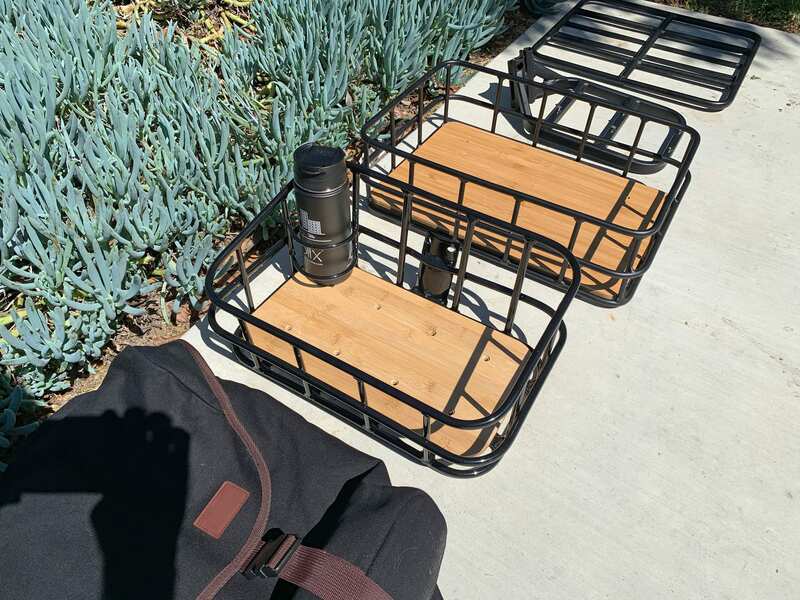 Included in the $2k base price are alloy running boards that could act as foot platforms or bag supports, and they incorporate beautiful bamboo deck vs. being empty and open. 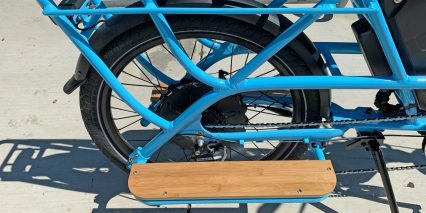 I love that the rear rack has standard gauge pannier hangers, so you could recycle existing industry-standard gear, and was very impressed with the 27-LED tail light that goes bright whenever the brakes are pulled! 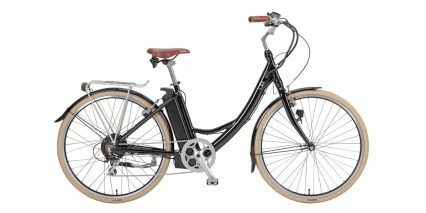 Yes, the bike includes integrated lights, extra wide fenders, and even reflective tires with puncture protection built in. 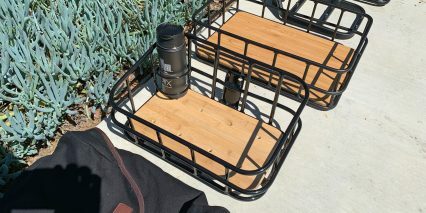 If you want to match the bamboo runnign boards, Blix sells matching deck accessory for the top of the rack as well. 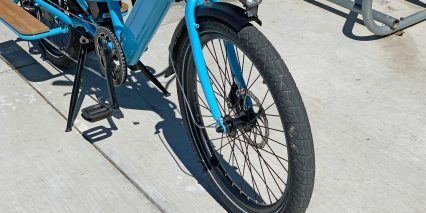 Driving this ebike is a a Shengyi gearless hub motor that weighs about 10lbs and is spoked into a sturdy 24-inch double-wall rim with extra-thick 12 gauge spokes. 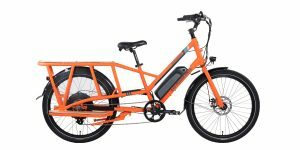 I’ve seen this motor brand before, on competing products from Rad Power Bikes, and heard that it’s very reliable from customers who have purchased and used it regularly for multiple years ongoing. 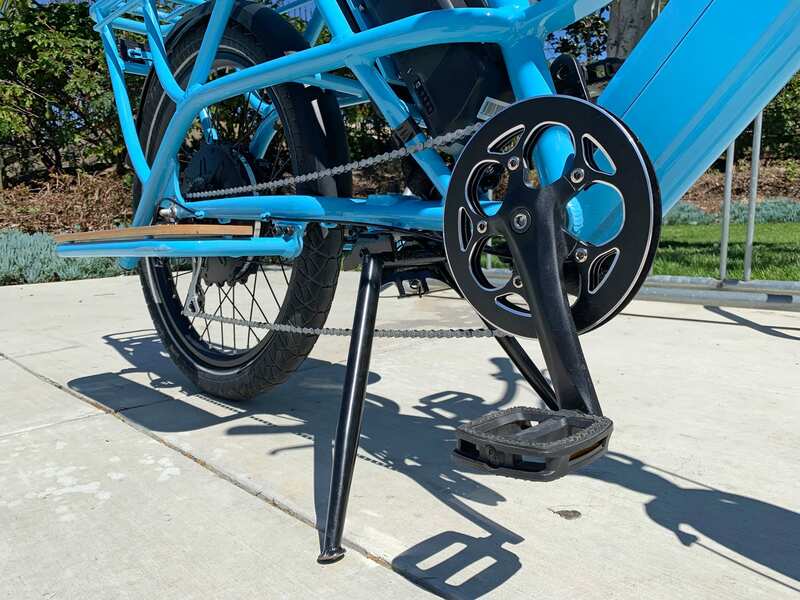 Gearless motors need to be larger, and are usually heavier than geared, because they produce power through electromagnetic staters and rare earth magnets pushing against each other. This, compared with a planetary geared motor that uses a faster-spinning motor that is geared down for torque. With a gearless motor, the further out those magnets are from the center, the more torque power is generated. 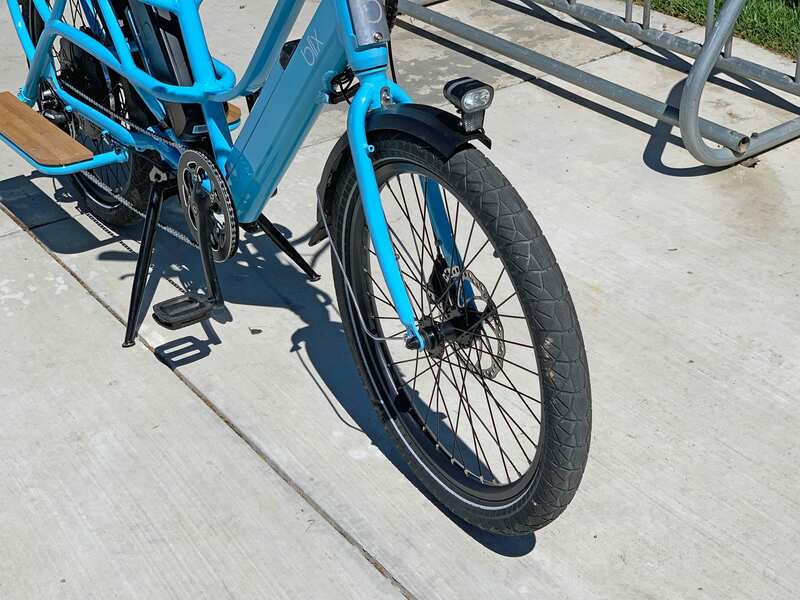 The advantage to this type of motor is that you don’t have plastic gears rubbing against each other to produce power, making it quiet and more durable over the long run. The magnets and staters don’t actually touch, so propulsion is smooth and quiet. However, when the motor is finished pushing, it also drags a bit because there is no freewheel mechanism. 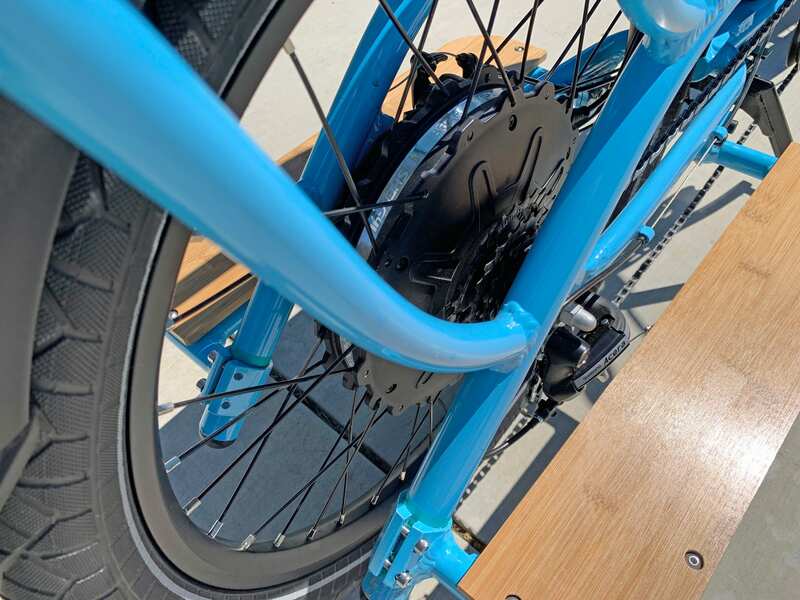 Some ebike companies that use gearless direct drive motors has designed their controller systems to recapture some of this magnetic drag as electricity for regeneration. That is not the case with Blix, and I don’t see this as a major drawback because it simplifies the controller and keeps it cooler. 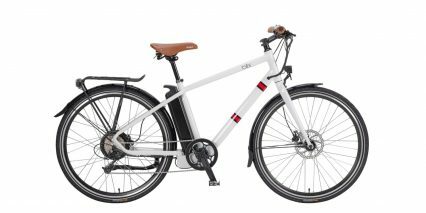 My understanding is that the electricity recaptured through regen on ebikes is only a small percentage, and the optional second battery option with the Packa is going to be much, much, more effective for extending range. 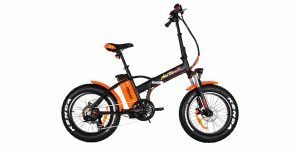 Offering between 500 and 750 watts of power output and up to 40 newton meters of torque, the motor is powerful and effective in most situations. One challenging scenario however, is starting from standstill while climbing. 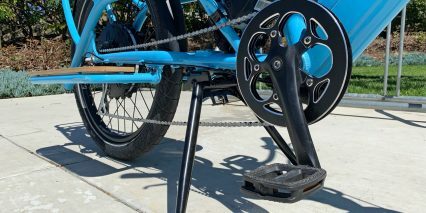 Gearless motors just don’t generate as much torque at standstill… so try to get some momentum going in, if you can. 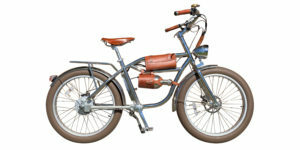 In short, this motor is quiet, tough, and very capable of transporting heavy loads, especially with the 11 to 32 tooth cassette. 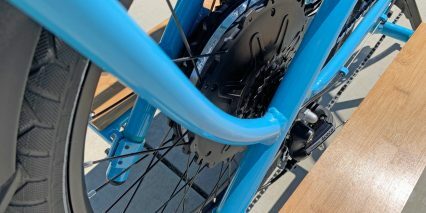 You might have to pedal along when ascending steep hills, but it should do fine on small and medium hills without too much input, as long as you’ve got a little momentum going in. 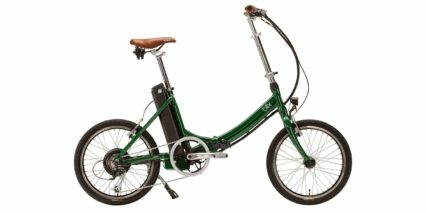 Powering the bike, it’s backlit LCD display, and two integrated LED Lights is a 48 volt 10.5 amp hour Lithium-ion battery pack. 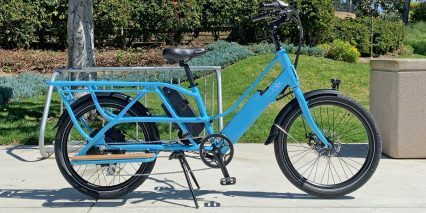 The case is a fairly standard design that I’ve seen on other ebikes, but never color-matched like this. It seats in from the left side of the frame and comes in at an angle. 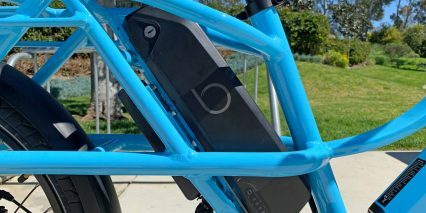 This allowed Blix to lower the top tube, providing a lower stand-over height and easier mounting/stabilizing of the bike. 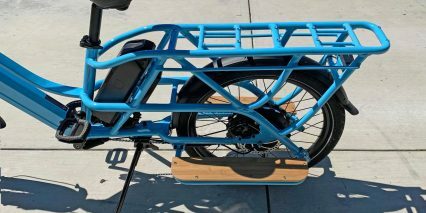 The capacity of this pack is pretty standard at roughly 500 watt hours, and should be enough for 20+ mile rides, even if you’re relying heavily on the throttle or using a higher level of assist. 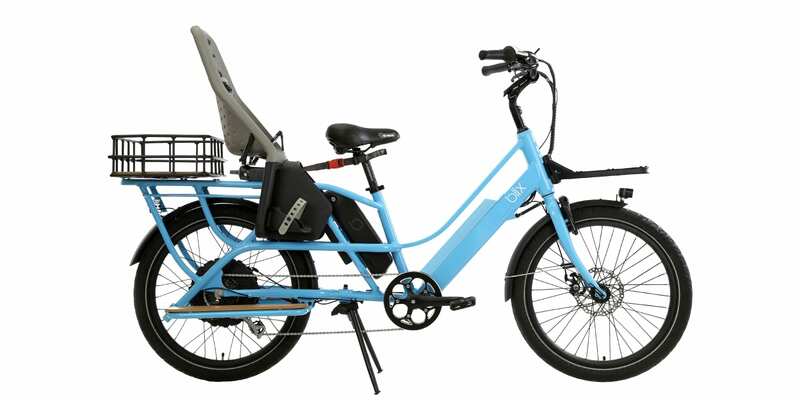 For those who want to go further, or plan on carrying lots of cargo over varied terrain, Blix offers a secondary pack rated at 48 volt 14 amp hours! 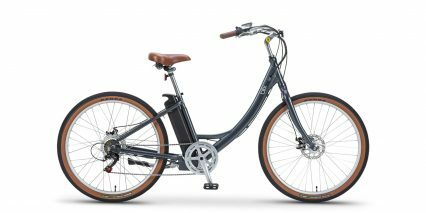 When combined, this ebike has over 1 kilowatt-hour of juice, to offer. 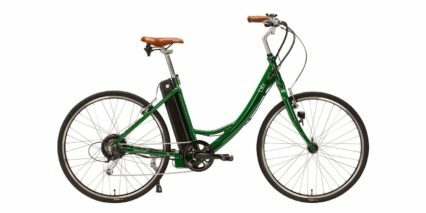 Only the default downtube battery has a built-in USB charging port, but they both use the same three amp charger. 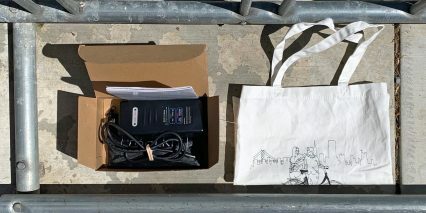 One of the compromises the company made to lower the cost of this second battery and the controller that draws from both, is that each pack must be physically plugged in separately. 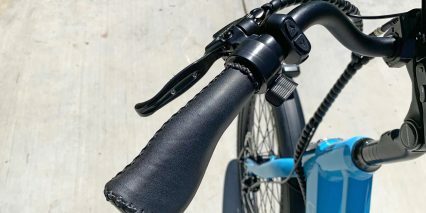 Some of the really fancy new systems from Bosch and Shimano are able to charge two packs at once, requiring less attention and handling by the rider. Also, both packs on the Blix Packa must be unlocked separately, using unique keys. 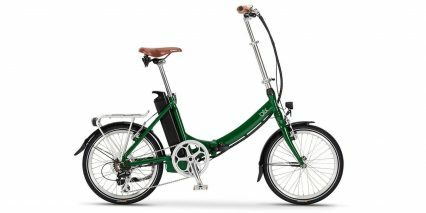 If you opt for their optional front wheel frame lock, there will be a third key in use… So, there’s extra time and clutter with the Packa, but at $2k, it’s priced at half of most other high-end multi-battery products on the market right now. 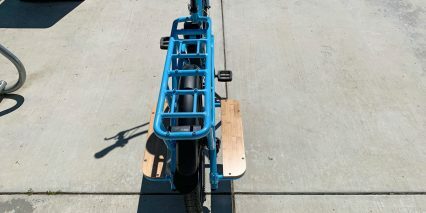 One very cool feature about the dual-battery setup is that the packs drain fairly evenly when riding. The onboard control system is smart enough to switch back and fort when the difference is greater than 5%. This reduces the cycle count of any given pack and reduces the chance that you’ll hit zero (which can strain the cells). To extend the usable life of most Lithium-ion batteries, it’s best to store them in a cool, dry location. Extreme heat can damage them, and cold will limit their range. 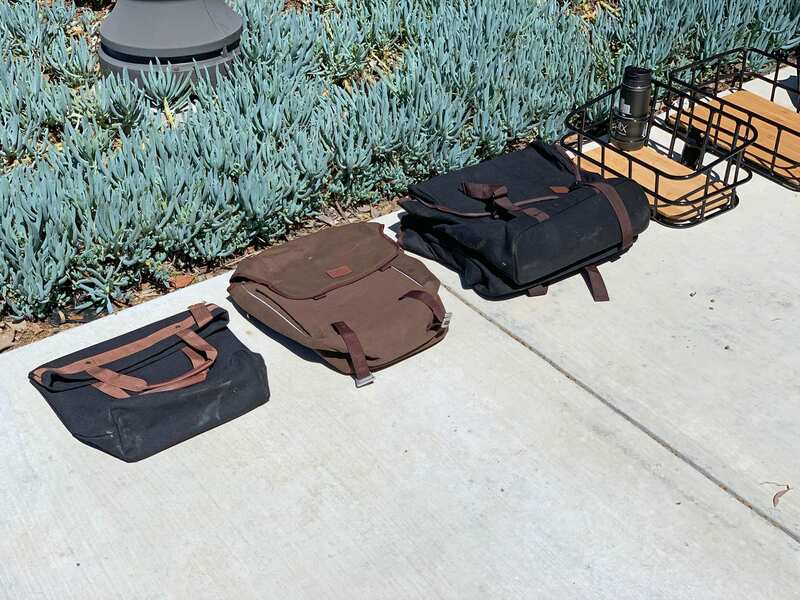 I’ve also heard that if you know you won’t be riding with a pack for a month or more, it’s great to keep it about half full or full but avoid letting it drain down all the way. 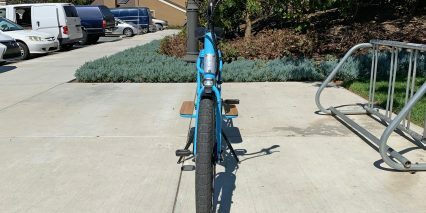 All things considered, I feel that the positioning of both batteries is fairly good, low and center on the bike, protected by the frame tubing from scratches and bumps at racks or tips. Operating the Packa is fairly straightforward, but there are a couple of hidden features built into the LCD computer display that I’d like to share with you. First of all, the LCD screen is fairly large and can be swiveled to adjust for glare, but it’s not removable. 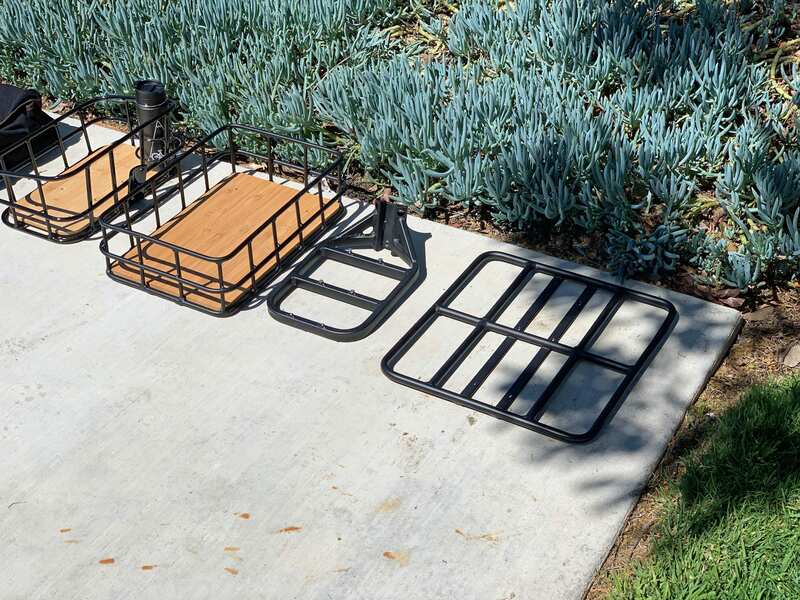 This means that it could take some weather wear and scratches over time and bike racks. It’s very thin, large enough to read easily from a distance, and incorporates a second USB charging port (in addition to the one on the battery pack) which could maintain a smartphone or other portable electronic device. That is, unless your device requires at least an amp of power (as many iOS devices do). 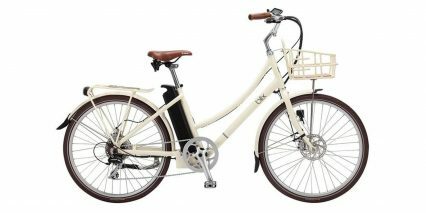 I believe that both USB ports on this bike deliver 5 volts 500 milliamps. To activate the display, just press and hold the M button on the base of the control ring which is mounted near the left grip. The LCD blinks to life quickly and shows several industry-standard readouts. 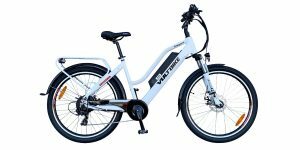 I was a little disappointed to discover that the battery capacity meter (which shows 10 bars) is really only a five bar meter. That’s pretty standard for cheaper displays, with each bar representing a 20% drop. Since there’s no battery percentage readout or range estimator built in, you won’t get as much precise feedback about charging. 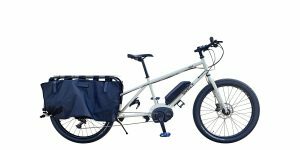 It might not be a big issue if you’ve opted for the second pack, but this ebike is definitely heavier than average at 72+lbs and could be a struggle to ride home with a heavy load, unpowered. For this reason, I’d recommend bringing the charger as a backup when going for longer rides. 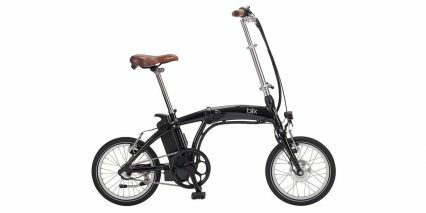 It would fit easily into one of the optional pannier bags that Blix sells. So, the display boots up into assist level one, and the throttle is active at this level. It’s not going to deliver as much power as levels 2-5, which was disappointing to me. 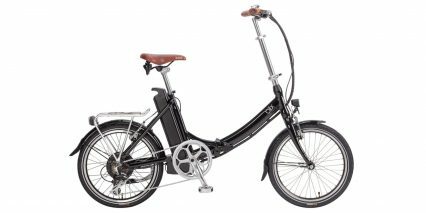 The trigger throttle offers variable power output as you press further, and yet, it’s capped by the level of assist in use. 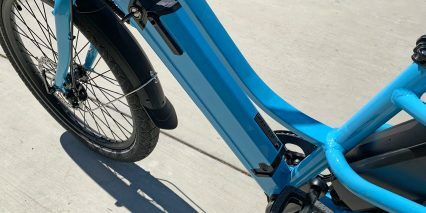 This means that you cannot use the trigger throttle to briefly add power for climbing or catching up with a friend. Instead, you’ll have to click the up arrow a couple of times and then use the throttle, then click back down to a lower level of assist to match your original setting. 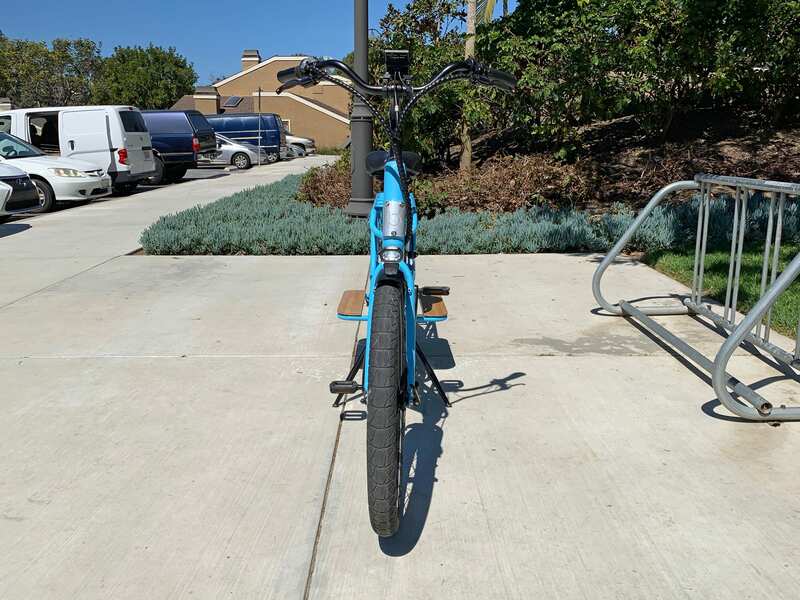 Some riders might prefer to always ride with assist level 5, but then the battery will run down faster and the starts aren’t as smooth… it’s more zippy in this mode. Finally, the lowest level of assist is zero, which basically supplies no power in assist or throttle mode. Zero level allows you to read the display for feedback about your speed, battery level, and other trip stats (as with the other levels of assist) while running the lights. 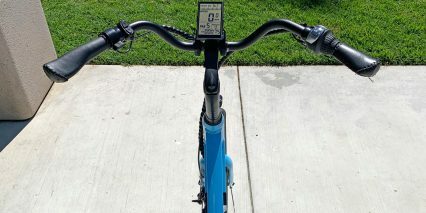 It’s a good option if you are running low on battery but still want to remain visible while pedaling manually. 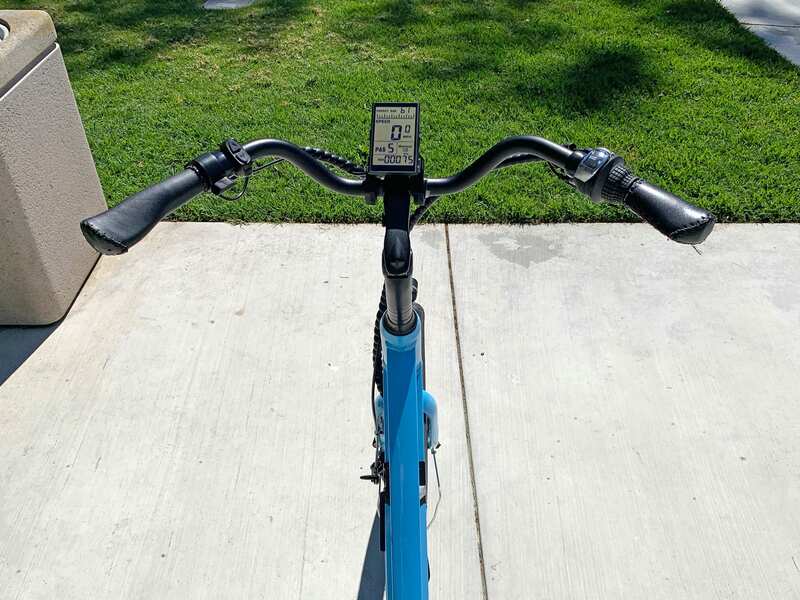 In order to activate the bikes integrated lights, hold up on the button pad for a few seconds. Walk mode can be activated by holding down ongoing, and you can get into the settings menu to change units (mph to km/h) or lower the top speed by holding the up and down arrows simultaneously. 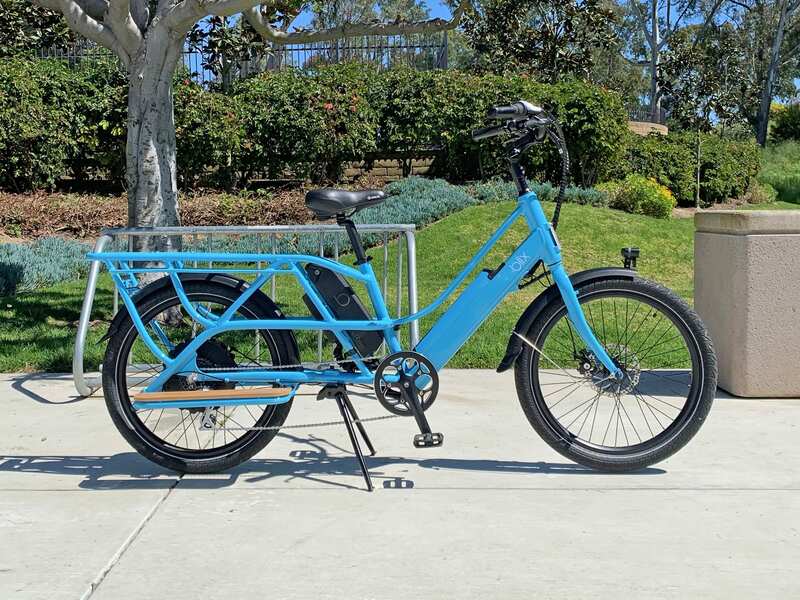 Beautiful custom frame design, the tubing matches and lines up perfectly, I love that it’s available in two frame colors and the cover of the main battery is paint-matched! 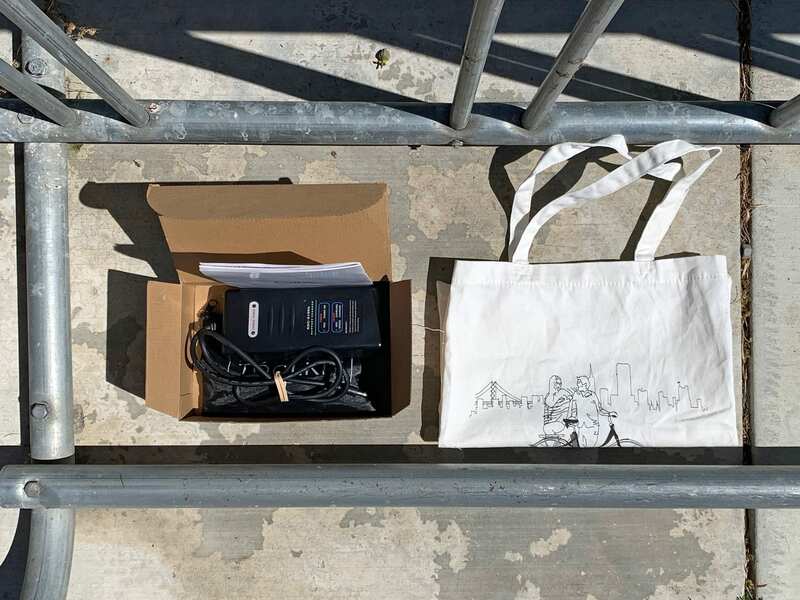 It’s neat that the LCD display and battery pack have 5 volt 500mA USB charging ports built-in, this could be useful for charging portable electronics, additional lights, or even for picnic situations where you remove the main battery and bring it with you. 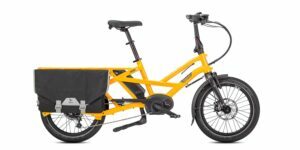 Nice review, and very nice cargo ebike. 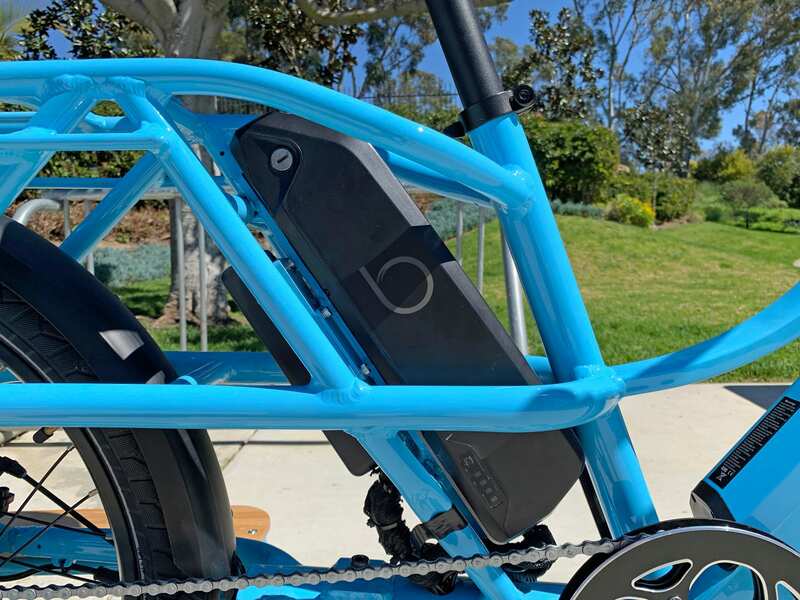 With so many ebikes being priced in the stratosphere, especially cargo ebikes, its refreshing to see firms like Blix, continue to provide high quality, VERY reliable ebikes at prices the masses (us 99 % ers) can actually justify and afford. 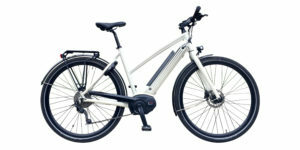 Seems like many ebike OEM’s keep forgetting that these are still just ‘bikes’, raising their prices or introducing new models at ever higher prices. 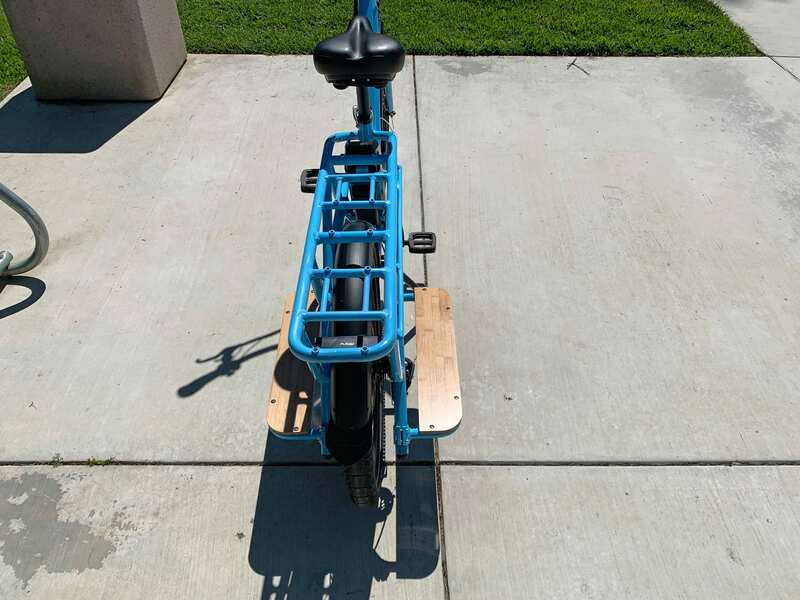 It’s just 2 wheels. Get it? Thanks for the typo tip! I’ll fix that ;) yeah, this product is exciting for many reasons. I like the design, lights, and the dual battery setup. It wasn’t something I knew about until Pontus called me and asked about doing a review. When I saw it, I was floored. Very cool and well thought out product here! 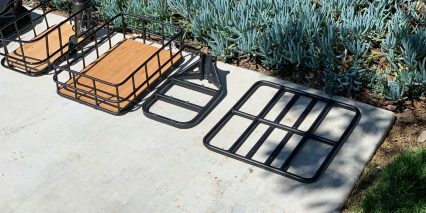 Do you think this could be stored on a vertical bike rack? or would that be impractical? 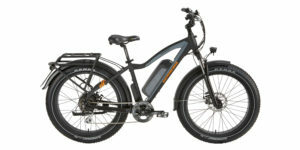 Also do you recommend the 2nd battery pack for SF hills? 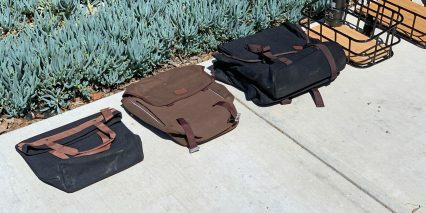 or do you think the standard pack would be enough for a 12 mile round trip commute in SF? Thanks for the review!